A lot of people believe that Islam can be considered as an act of terrorism; however, this is a huge misconception. People tend to believe in what they want to believe and how they want to interpret things. This belief causes people to interpret things from the Quran and things the prophet said in the worst way possible. The reason why they do this is because Islam in general as a religion is unfamiliar to them; therefore, they do not accept and understand it. Muslims now feel like they are being accused of things they did not do and this causes them to feel scared and uncomfortable. Even though there are extremists, this does not mean that this misconception should be generalized. For some people, when they hear Islam and Peace in one sentence they feel like it does not match or work together. However, for others Islam is peace. This idea creates many conflicts and misconceptions that should not be in people’s mind. Islam is religion of peace and that is why I have that sentence written on my canvas but in Arabic “الاسلام دين السلام”. I wanted to make it clear that Islam or being a Muslim is not the same as being a terrorist or being part of terrorism. These two words complement each other as they help and play a big part in one another. 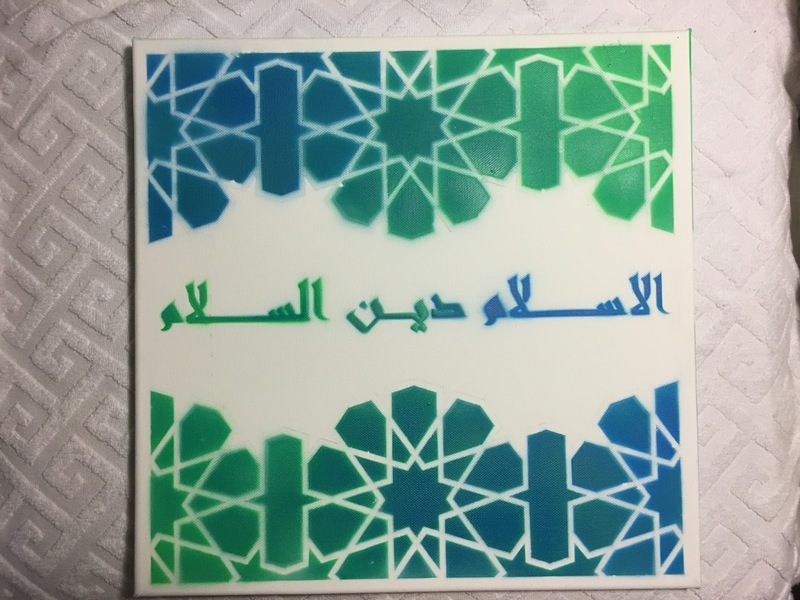 At first I knew I wanted to combine things we took in class like calligraphy and arabesque and put them together and make a bigger idea with both. Colors play a big and important role as a chose them wisely and for a specific reason. I drew the arabesque on paper and had the design and how I wanted to look like. I of course asked for helped and researched about it so it looks good. It was fun finding out how to make it and how to design it in my own unique way. I focused a lot with the measurements to make it look proportional. After I drew it I scanned it and fixed on paint to make sure all my measurements were accurate so it would look perfect. I bought a canvas as well and took the measurements of it then fixed my design based on it. I printed it and used the laser cutting machine to make it easier for me. I put them both together and started spraying the whole thing with the colors green and blue. I chose the colors Green and blue for a specific reason. The color green represents Islam, which is very known and common. Usually, when you want to connect Islam with a color it is green. It is said that green is the prophet Muhammad’s favorite color as he wore a green cloak and turban and has many references to the color green in his writings. I also thought maybe it is also related to paradise somehow, since it is always full of trees and greens as we took in class. It is also said that blue represents peace. The color blue is very safe, calming and protective, which is somehow the same thing as Peace. I thought I want to combine both together using different forms of art especially colors. I felt like it is not just the words or the form of art but also the colors used to represent both Islam and Peace. The fact that I made the two colors blend into each other is the same reason to why Islam and Peace coexist.